Heeft u een vraag voor Summer Breeze Guest House? Gelegen in Mirissa Beach is Summer Breeze Guest House de perfecte keuze voor reizigers die Mirissa en omgeving willen bekijken. Gelegen op 0.4 km van het hart van de stad, bevindt dit 1.5-sterren hotel zich op een excellente locatie met de grootste attracties binnen handbereik. Dankzij de praktische locatie liggen alle belangrijke trekpleisters in de buurt van het hotel. Het Summer Breeze Guest House biedt een onberispelijke service en alle essentiële voorzieningen om reizigers een plezierig verblijf te bieden. Het hotel heeft een uitgebreid aanbod aan services, inclusief 24-uur roomservice, 24-uur beveiliging, 24-uur receptie, wi-fi in openbare ruimtes, parkeerplaats. Hotelkamers zijn zorgvuldig ingericht om het hoogste niveau van comfort te bereiken, met draadloos internet (gratis), rookvrije kamers, airconditioning, bureau, balkon/terras in iedere kamer. Het hotel biedt geweldige recreatiemogelijkheden die uw verblijf onvergetelijk zullen maken, zoals tuin. 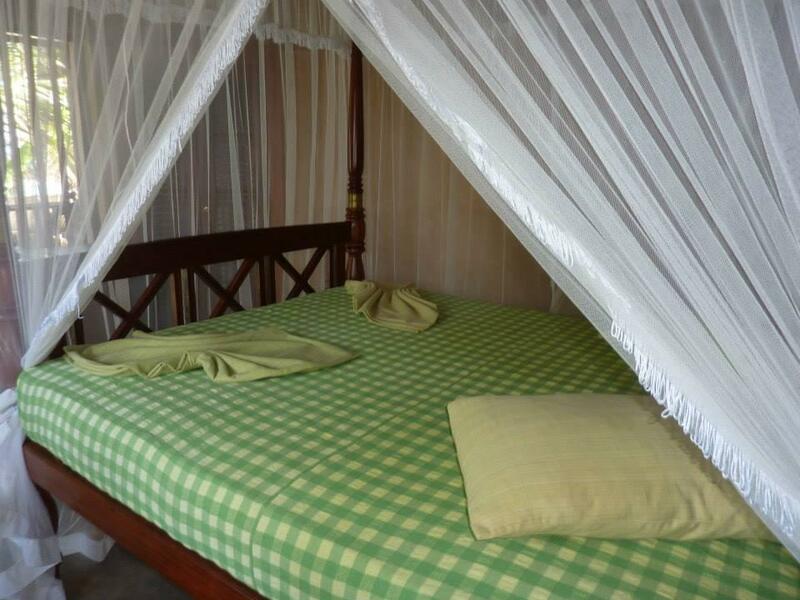 Als u zoekt naar comfort en gemak in Mirissa, dan is het Summer Breeze Guest House uw thuis ver weg van huis. Used to have better times probably. Pictures promise more then you get. Strange staff, no welcome, no goodbye. Good breakfast tho. Rooms ok.
We LOVED staying in this guesthouse and we would go back immediately! The lady who takes care of the property was super nice also. For us the only minus is the management of the guesthouse. It is hard to communicate in english, so there are two foreign women there, partly as guests, but they also intervene in manegement. If you arrange things with them, you can get some privileges, if they are not there, that becomes impossible and it results in guests being treated differently. The Summer Breeze has direct beach access and although I arrived early Olga very quickly organised for my room, with a balcony about 15 metres from the sea shore, to be ready. The bed was comfortable and had an unusual colour scheme of blue and yellow sheets made of a calico like material. Breakfast, in the garden setting watching the surfers, was a choice of pancakes with honey and coconut or Sri Lankan spicy omelette with a different fruit platter each day. The price per night, including breakfast, was about 36 Euros per night. Other meals can be had at the many restaurants either on the main Mirissa beach or lining the road adjacent to the beach at more economical rates. The location is perfect, the garden is nice, and the rooms are comfortable. I loved my stay at Summer Breeze. It's location is perfect - right on the beach, with the chilled out Surf Shack restaurant nearby on one side; and the main beach nearby on the other side. The garden is a lovely place to relax and watch the sea just a few feet away. The rooms are nice, the staff and breakfast were good. The only issue is that it's pretty expensive, although that's a problem all over Mirissa. I found out later that there are very similar places available for less than half the price. It was great and so is the hotel.Especially location is very very nice with direct access to the beach. But for 85€ per night even in Europe you get much better conditions. Would book it again if its around 50€ per night. The only good thing about this place is the location. It's beachside and super easy to reach the beach and beachside restaurants and bars. Other than that we were not impressed. It's way overpriced. The rooms are in dire need of plastering and painting and the beds need new sheets. Decent breakfast but compared to other places we stayed in Sri Lanka it was lacklustre. Non-existent service. Wouldn't recommend staying here, the other places along the beach looked nicer! The place is in a worderful corner of Mirissa, steps away from an enchanting beach. Rooms are basic, but with renovated toilets and comfortable beds. Unfortunately, service is very poor, breakfast very basic and staff fairly unfriendly. Location right in front of the surf spot, Quiet and far apart of the noisy area. you can take a beautiful yoga lesson just next dior eith amazing waves sound behind the scene. From the very beginnnig our relatiin with the staff was really poor and difficult in terms if communication, we thougt that it was probably a language barrier..but when we arrived at 4:00 am into the hotel..we didnt get any kind of welcome from them,help or information! We didnt get clean towels in the entire week,not even the minimum clean service. The staff is not helpfull at all,no smiles,no attention,nothing..INEXISTENT! The last day our surprise was,the owner is living upstairs at all time,we thought he was a guest, our disconfort was mention to him and what he did was...fire the guy who was working hard and alone in the entire hotel probably not being warm due to the overload Work. Its such a shame because the place has so much potencial, but i will never recommend the stay to any friend or family member. The guest house is rather basic, but clean, and the AC's in the rooms work well. The location is fantastic,slightly off of Mirissa beach; far enough away to avoid the chaos, but close enough that you can wander down to the bars and restaurants in a matter of minutes. The view is also great. In terms of food, they only serve a rather average breakfast, so you'll have to go elsewhere for any food after 10.30am. Overall, we had a pleasant stay, however, my main complaint would be that the staff were not the friendliest bunch, to the point that we felt quite uncomfortable at times and this soured our experience somewhat. bets place to stay on the beach! Right on the beach, yet a little bit further from all of the people so basically you have your own private beach. The staff were so helpful. The rooms were super clean. I had a private room with a balcony overlooking the ocean. I can't believe it was so cheap! Definitely worth the price. Will return in the future! Go to Summer Breeze! Location (just on the beach) and a cheap price. Great place to stay if you want something cheap and right on the water. proximity to beach, that is all. Das Guesthouse hat wirklich eine tolle Lage am ruhigeren Strandabschnitt mit einem super Meerblick und leckerem Frühstück! Leider war das Zimmer ein sehr dunkles graues einfaches Zimmer, ein Mosquitoparadies. wir hatten das obere Zimmer in der cabana. leider hat der Zustand des Zimmers etwas zu wünschen übrig gelassen - Wasserhahn kaputt, Lampe auf Balkon defekt, Bettlaken sehr rau,.... die Mitarbeiter waren aber sehr nett und hilfsbereit. alles in allem finde ich den Preis von 55 € für den Standard leider nicht gerechtfertigt. Der junge Manager war freundlich, nicht aufdringlich und hilfsbereit. Die Zimmer waren einfach aber sauber. Der Preis zu hoch für den Zimmerstandard. Cabana im 1. Stock war für mich Alleinreisende beste Lösung. Die Zimmer waren einfach aber sauber, kein abschließbarer Schrank oder Safe vorhanden, Bett gut mit Moskitonetz. Wlan funktionierte immer mal wieder. Guesthous bietet keine Mahlzeiten und auch keine Getränke an. Aber alles in direkter Nachbarschaft zu erhalten. Manager war ruhig, unaufdringlich und hilfsbereit. Lage ist super, wenn man nicht mitten dring sein will, sich mal zurückziehen möchte. Dennoch ist man in einer Minute an Hauptstrand.